The Llŷn Peninsula reaches west from the mountainous heartland of Snowdonia to form both the northern limit of Cardigan Bay and the southern arc of Caernarfon Bay to the north. 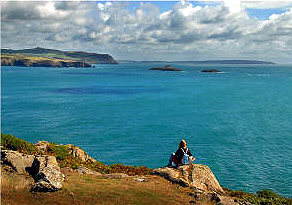 It is the northernmost and smallest of the three great peninsulas which dominate the west coast of England and Wales - Llŷn, Pembrokeshire and Cornwall. Llŷn has much in common with these larger cousins; its coastline is both dramatic and beautiful with numerous fine sandy bays, isolated coves and magnificent cliff scenery. Inland, a range of fine volcanic hills give superb views of the entire peninsula along with the neighbouring peaks of Snowdonia. Walking on any the Llŷn Peninsula's circular walks which explore some of the finest sections of the coast along with a number of Llŷn's more prominent hills. With distances from 2.5 to 7 miles, all abilities are catered for - from those looking for a casual half-day walk to add colour to a holiday, to the more ambitious who may walk here as an alternative to Snowdonia. Why not follow the footsteps of the 5th Century Celtic monks and venture along the Pilgrims' Trail? The West part of the Church of St Cian (Llangian) is of the 13th Century. Within the grounds there is a rough stone pillar commemorating the resting place of Melus the doctor. It is the only record in Britain of a doctor on early Christian inscriptions. The stone is of the 5th or early 6th Century.